when you were a teenager? And did you? So what has happened since you don’t have anyone to remind you? Life happens, and you’ve been spending your day driving to work to sit in front of a computer before you drive home to sit in front of the television or the computer. Sitting takes its toll on your posture, and not in a good way. Rounded shoulders develop over time. Slumped shoulders create with a curved spine which not only eventually impacts your internal organs but even your hips and knees, all the way down to the feet. so aches, pains and discomfort set in as the 26 vertebrae, those bones in the spinal column, line up incorrectly. Improper alignment can lead to shortened or weak muscles and decreased flexibility or range of motion. Poor posture is also linked to breathing issues, indigestion and constipation. times each week can improve your posture? In addition, as you continue the practice of Pilates, you will start to feel better and look better as well. How can that be? Pilates is an exercise system developed by Joseph Pilates, a German immigrant, who was a prisoner of war in England during World War I before he moved to New York City in the 1920s. He created a revolutionary system of exercises, that if done properly and on a regular basis, creates a strong and flexible core. That core consists of the muscles surrounding your spine in the center of your torso. In other words, as you practice Pilates you are strengthening and lengthening the muscles that properly support your spine, thus keeping your vertebrae in a nice straight column. Learning and practicing Pilates is best done under the watchful eye of a personal trainer who has legitimate Pilates training herself. At one time, the practice of Pilates was almost limited to ballet dancers who had become injured in the studio or on the stage, but as more people learned the benefits of Pilates, the label “Pilates” has been tacked on all kinds of exercise. Anyone, for example, can turn on cable TV and flip on some Pilates exercises. That’s fine for someone who is familiar with the exercises. But how do you know if you’re performing the Pilates exercises properly? That’s where a certified Pilates trainer comes in. First, she will talk to you privately about your own personal situation, then you will start training with a plan designed to meet your goals and to improve your fitness level. The trainer will be able to demonstrate the exercises and guide you through the practice with verbal support and encouragement. You will receive gentle corrections as your body adjusts to this new way of moving.. Practice is one of the hallmarks of Pilates. But don’t be concerned that Pilates is boring. It’s not. A full Pilates studio is equipped with apparatus, modern versions of Joseph Pilates’ original equipment. Safety is an obvious concern, and that’s just one reason you want to select a trainer who is educated in all aspects of Pilates. The trainer will be able to assist you on the apparatus, and some exercises offer variations or effective modifications using a smaller apparatus, such as a ring or ball, or even just your own body on the mat. The movements may feel unfamiliar at first, and that’s because changing existing patterns is strengthening, both physically and mentally. The options are almost endless. The foundation of the Pilates method remains consistent. The exercises are performed slowly and rhythmically, and with mental focus, so the student develops a strong and flexible core. With your trainer, get ready to stretch and move, extending your body and your mind in order to restore that strong posture you had as a child. You will look better, move better and feel better. 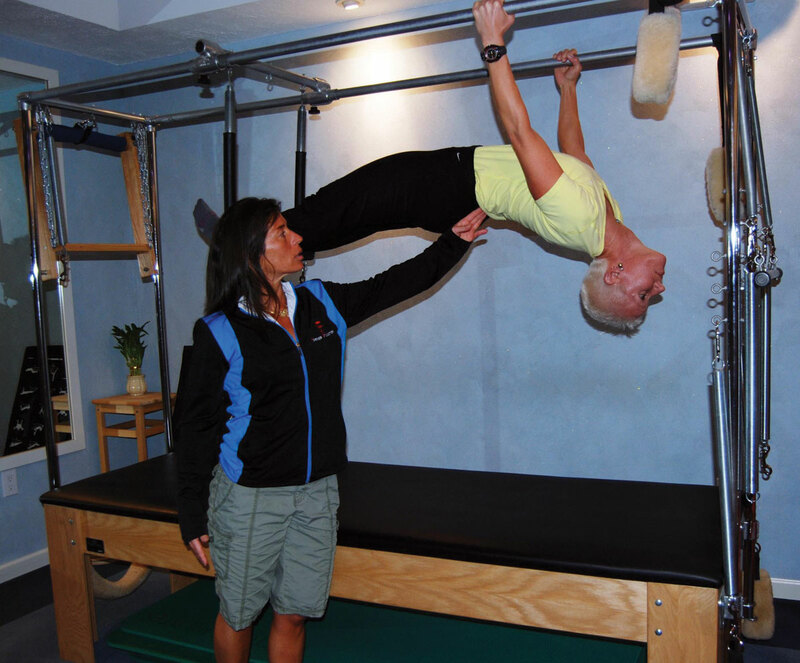 Nancy Hawkins Rigg is the founder and owner of Forever Fit Foundation, a personal training business specializing in Pilates Gyrotonic, Gyrokinesis, Yamuna Body rolling and sport-specific training. 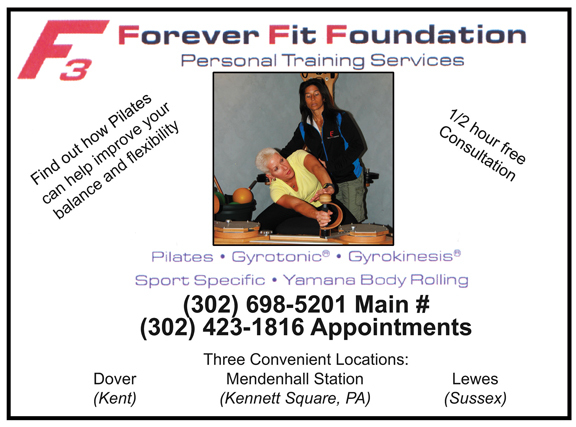 Forever Fit Foundation accepts clients at three sites: Dover and Lewes and Mendenhall Station, Pa, just over the Delaware line. A certified athletic trainer, she earned her bachelors degree from the University of Delaware and her master’s degree in exercise science and sports medicine from Miami University in Ohio. Please call 302.423.1816 or 698.5201 to schedule an appointment or for more information. Next Story → Bare Essentials Is A Bra Fitting Boutique For The Modern Woman!! !